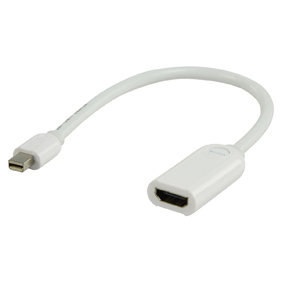 Mini DisplayPort To HDMI Socket - Displayport Cable Displayport to VGA Displayport to VGA Displayport to HDMI, Hdmi Cables Same Day Dispatch On Our Leads If You Order Before 2pm Weekdays. The Mini DisplayPort to HDMI allows the operation of HDMI devices at the mini display port on your notebook or PC. MINI DP to HDMI female adapter cable for MacBook,MacBook Pro iMac Intel,PowerBook 12" DP model. Currently viewing: Mini DisplayPort To HDMI Socket - Displayport Cable Displayport to VGA Displayport to VGA Displayport to HDMI, Hdmi Cables Same Day Dispatch On Our Leads If You Order Before 2pm Weekdays.